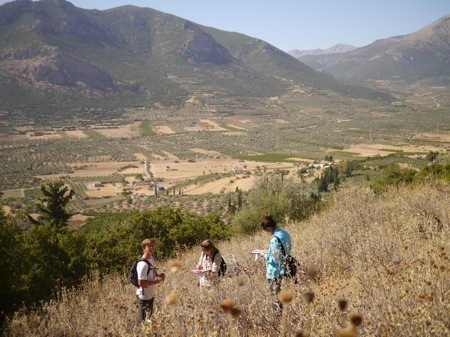 Yesterday was the last full field day with our field teams on the Western Argolid Regional Survey. So I thought I should do a traditional “Good, Bad, and Ugly” post from our field season. I should emphasize that the project was pretty remarkable. We covered an amazing amount of territory (almost 5.5 sq km), our field teams held up well, our team leaders remained (more or less) in good spirits, and we produced interesting results. With one week remaining we mostly have odds and ends to sort out, some drawings and photographs, and the usual work of data curation. Units, Resolution, and Efficiency. We walked close to 2400 units while keeping our average unit size to under 2500 sq. m. and through most of the field season we walked an average of 92 units per day. The average unit took a little over 5 minutes to walk so taken together our field teams walked for around 7 hours and 40 minutes per day or about 2 hours per team per 6 hour field day. There are certainly gains to be made in efficiency, but the cost will be steep with our current manpower. Good Field Clothing. The project produced a spectacular display of innovative, synthetic, hip looking field clothes. 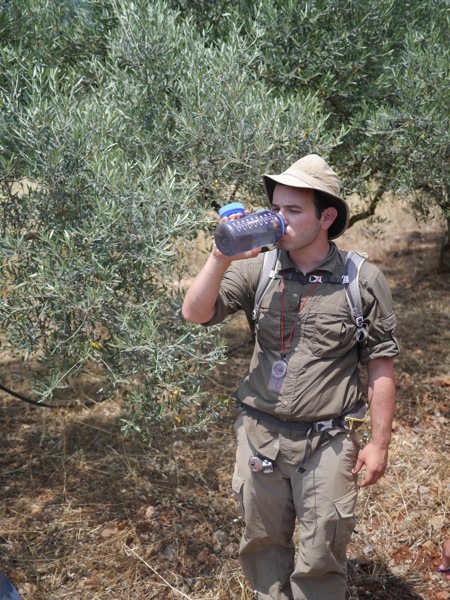 The maquis, heat, spiders, and sweat took a toll on all field clothing. I destroyed a pair of decent field pants, but my Mountain Khakis held up with only one repair (generously made by Sarah James). Better still, my sub-$20 Dickies long-sleeve work shirts proved their reputation for indestructibility. 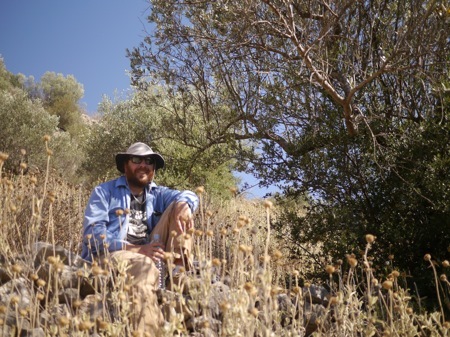 Whatever I lost in terms of being stylish, my clothes survived the rigors of a 6+ week field season. Beautiful Landscapes. We could not ask for a nicer survey area in terms of scenery. 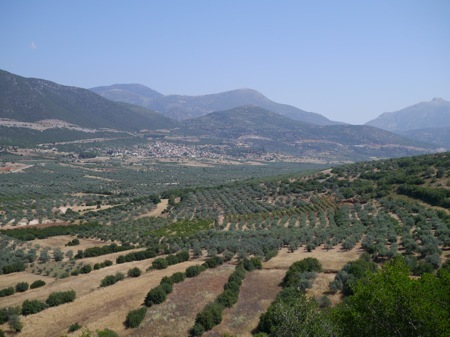 The upper reaches of the Inachos Valley was beautiful especially in the morning light which filtered through the olive trees and the vanishing dew. Maps. We mapped our survey units using two sets of very recent satellite images on we printed on a sheet of paper and other we carried with us on our Garmin Oregon GPS units. The two maps were taken at different times of year so they provide different views of the vegetation in our survey area. Mapping onto these high resolution and very recent satellite images was much easier than our practice with earlier surveys where we mapped onto 1:5000 maps or the 1960s era aerial photographs taken by the Greek army. I’m old. This was the hardest field season that I have ever experienced. My body started to ache about week 4 or 5 and by the end of week 6, I was ill with some kind of fatigue induced cold. My ankle is swollen, my knee is glitchy, and I’m riddled with little cuts, sores, and rashes. Boots. 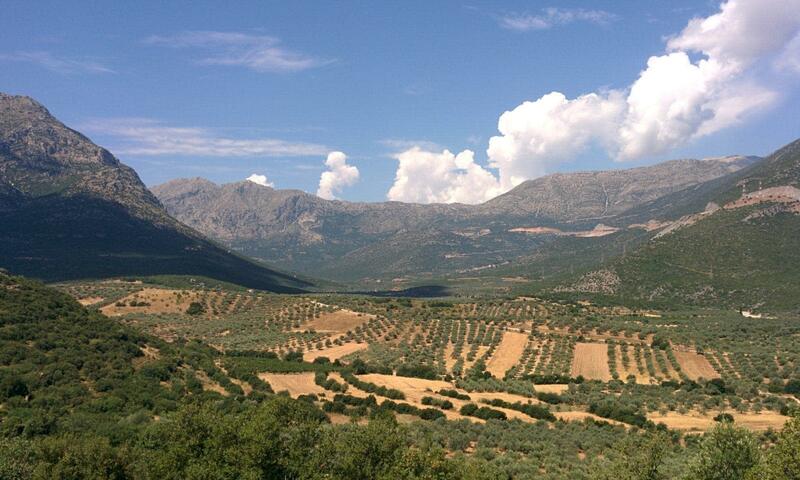 The sharp-edged limestone of the Argolid and Corinthia is absolutely brutal on boots. So far this season, I’ve seen gashed soles, torn leather, eviscerated nylon, and other boot related disasters. Puppies. I’ve never been a dog person, but I’ll admit that watching the puppy saga unfold this year on WARP was heartrending. I’m glad that we managed to save the “micro-dog” although I’m worried that it’ll never learn to walk properly (although people say at 6 weeks no puppy can walk properly). So this is not a bad thing in a traditional sense, but it was an unexpected emotional outlay. Spider Sticks. The Western Argolid is filled with large spiders who build beautiful webs between closely spaced trees. These things are creepy and the webs are sticky and annoying especially when you come upon them unexpectedly while field walking. Students (and staff!) discovered the value of a the spider stick. 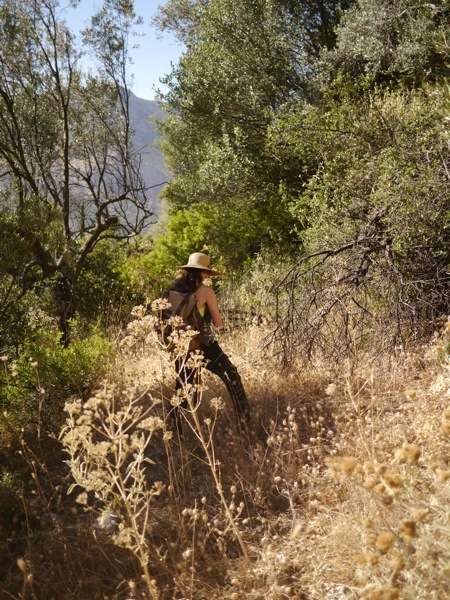 This is a stick – usually made of olive wood – that can brush aside spider webs as you field walk. Unfortunately, they can also be used as weapons to beat down a team leader who has pushed a bit too hard. We only narrowly averted a spider stick uprising in the waning weeks of the season. Paper Forms. Our data recording involved two steps. 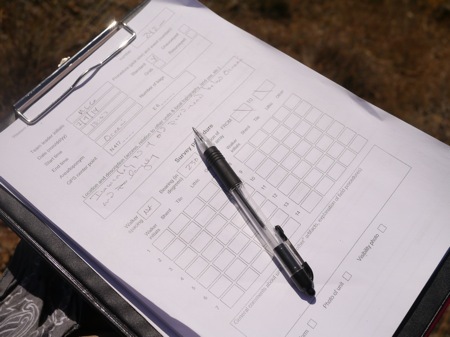 Writing on paper forms in the field and keying the data into a database. The days of paper forms are almost over, however. We saw how the Mazi Project is using iPads to streamline data flow from the field to the laptop. I think there is also a chance that iPads will allow for better, more robust datasets that include more images, more field drawings, and more integrated data both in the field and in the lab. 3. Larry Potter. This season was the season of Larry Potter. As my colleagues pointed out, this cohort of students have been involved with Larry Potter from the time they learned to read and the novels, movies, and soundtracks dominate their world. In fact, we had to talk about the possibility that the bamboo sticks used to separate lots in our workspace might be tempting swords, Quidditch sticks, or wands and how that might be facilitate an unhelpful blurring of the line between the productive space of the archaeological workroom and the fantasy space of Larry Potter and friends.